Pre-Cut Quilt Kit - Baby Tumbler Quilt The quilt top finishes at 40 " x 47". The kit is totally pre-cut for you using precision die cutting (Accuquilt). The tumbler shapes are pre-cut and the corner tips are trimmed off. The kit includes all tumblers, yellow border and pre-cut squares in the outer border. All you have to do is pick up a pair and sew. This kit is ideal for a baby gift, it goes together so quickly you can piece it in an afternoon. 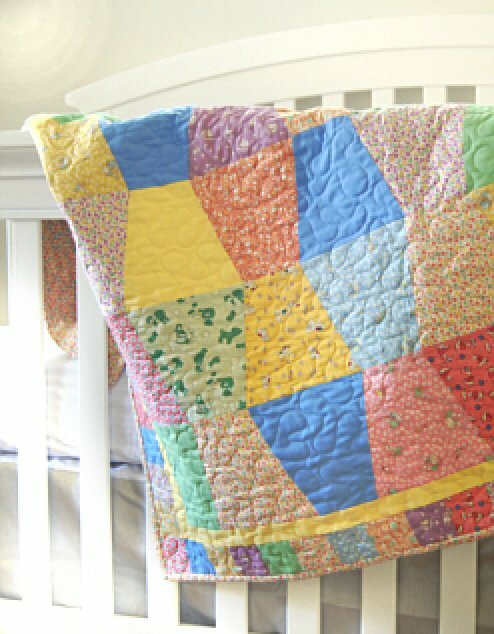 Perfect for a beginner quilter. 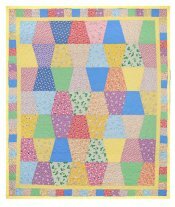 This quilt kit is made from quilt shop quality fabrics all 100% cotton in 30's reproduction prints and look adorable in a nursery. - . Backing fabric and the binding fabric are NOT included and will need to be purchased separately. 3 yards are required for the backing. The fabrics are not pre-washed but, they have been tested for color fastness.